Follow Ryersonian reporters Alexis Allison, Samantha Sobolewski and Alisha Sawhney at the event. Calgary Mayor Naheed Nenshi will be speaking tonight at Ryerson in room ENG103 from 6:30-8:30pm as part of the Jack Layton Memorial Lecture Series. Follow along here as we post live coverage of the event. 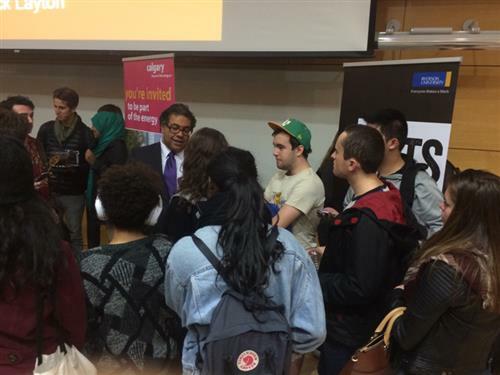 Nenshi speaks with a media scrum after the lecture, tune into the Ryersonian tomorrow for further coverage and video comment. Nenshi telling Canadians to break down the barriers of entry to voting using social media. That's a wrap, folks. Nenshi speaks to a media scrum on his way out.